Employee at Israeli organization takes picture of Ambassador Friedman with image of Holy Temple without consent. Organization apologizes. 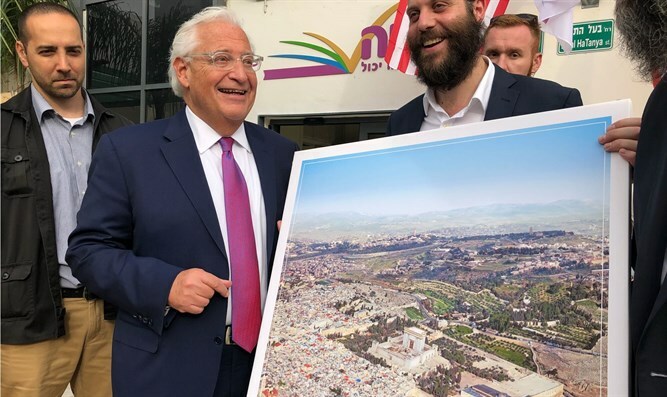 US Ambassador to Israel David Friedman caused a furor on social media by appearing in a photograph next to a picture of the Temple Mount which depicts the Holy Temple. The picture, which was a real photograph of the modern Old City of Jerusalem and the Temple Mount with the Holy Temple digitally imposed over the Dome of the Rock, was presented to Ambassador Friedman by the 'Achiya' organization during a tour in Bnei Brak. An official at the US embassy responded to the criticism Tuesday evening, claiming that the ambassador was unaware of the content the gift given to him at the time. "We demanded an apology from the organization for allowing one of their employees to present the controversial image to the ambassador during his visit, and the American policy is absolutely clear - we support the status quo regarding the Haram al-Sharif/Temple Mount," the embassy source said. The embassy issued a statement saying: "Ambassador Friedman was not aware of the image thrust in front of him when the photo was taken. He was deeply disappointed that anyone would take advantage of his visit to Bnei Brak to create controversy. ‎The US policy is absolutely clear: we support the status quo on the Haram al-Sharif/Temple Mount." The organization apologized for the incident and said: "The management of Achiya wishes to apologize to the US Ambassador to Israel, David Friedman, and to the US embassy in Israel. A member of the Achiya staff presented the picture to the ambassador without the approval of Achiya, the embassy, or the ambassador." "We would like to thank Ambassador David Friedman and the staff at the embassy for the professionalism and courtesy they have shown in visiting Achiya to shed light on the important work we do that is changing lives for the better. Unfortunately, the event was marred by a cheap political stunt. We again want to thank the ambassador for his time and deeply apologize for the incident that could have been prevented," the organization added. Achiya is a non-profit organization that works to integrate children with learning disabilities.